Moskauer Nächte [3:59] Also available on the Crowning of a Great Career CD. Wolgalied [4:57] Also available on the Crowning of a Great Career CD. Leuchte, Mein Stern [3:58] Also available on the Crowning of a Great Career CD. Zweifel [4:41] Also available on the Crowning of a Great Career CD. Die Krippe Von Bethlehem [4:13] Instrumental. Also available on the Crowning of a Great Career CD. Metjelitza - Liebeslied Im Schneetreiben [3:00] Also available on the Crowning of a Great Career CD. Die Legende Von Den 12 Räubern [4:40] Also available on the Crowning of a Great Career CD. 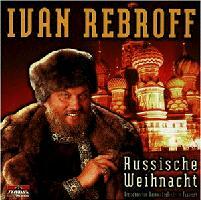 All but one track from Russische Weihnacht mit Ivan Rebroff LP padded out with 7 tracks from the Crowning of the Great Career CD.